Provides a method for tracking network circuit information for the UDP message system. Definition at line 61 of file llcircuit.h. Definition at line 57 of file llcircuit.h. Definition at line 58 of file llcircuit.h. Referenced by LLMessageSystem::flushSemiReliable(), LLCircuitData::getPingDelayAveraged(), LLMessageSystem::sendReliable(), LLMessageSystem::sendSemiReliable(), and LLCircuitData::setPingDelay(). Definition at line 59 of file llcircuit.h. Definition at line 71 of file llcircuit.h. Definition at line 63 of file llcircuit.h. 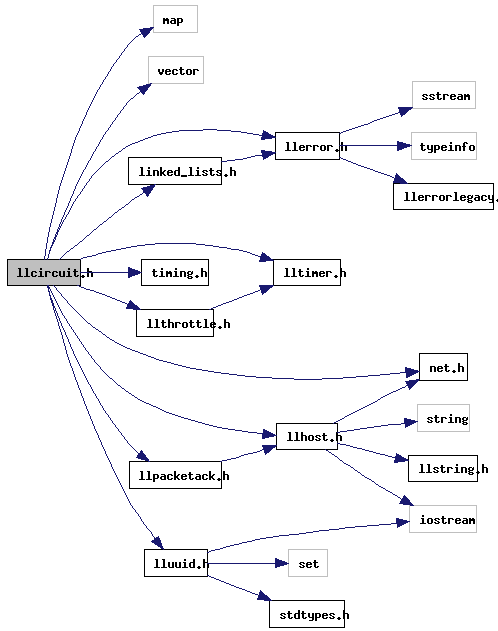 Referenced by LLCircuitData::checkPacketInID(), LLCircuitData::nextPacketOutID(), and LLCircuitData::setPacketInID(). Definition at line 70 of file llcircuit.h. Definition at line 68 of file llcircuit.h. Referenced by LLTemplateMessageBuilder::buildMessage(), LLTemplateMessageReader::decodeData(), LLTemplateMessageReader::decodeTemplate(), LLMessageSystem::sendMessage(), tut::LLTemplateMessageBuilderTestData::setReader(), zero_code(), LLMessageSystem::zeroCodeAdjustCurrentSendTotal(), and LLMessageSystem::zeroCodeExpand(). Definition at line 54 of file llcircuit.h. Definition at line 53 of file llcircuit.h.